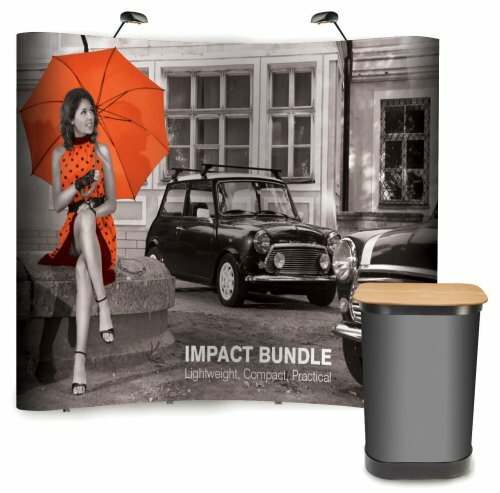 Pop up displays, also regularly referred to as pop-up stands or just pop ups are the most popular way to achieve a large free-standing and virtually seamless graphic wall to create serious impact. Despite their large assembled size when dismantled they pack down very small and are easily transportable by car. 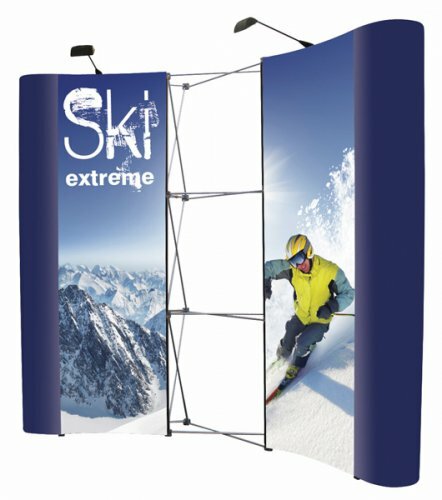 All pop-up systems comprise a lightweight frame which is quickly and easily erected by one person in next to no time, graphic panels are attached magnetically to the magnetic bars of the frame, other staff members will quickly learn that pop up displays are by far one of the most cost effective means to exhibit today. 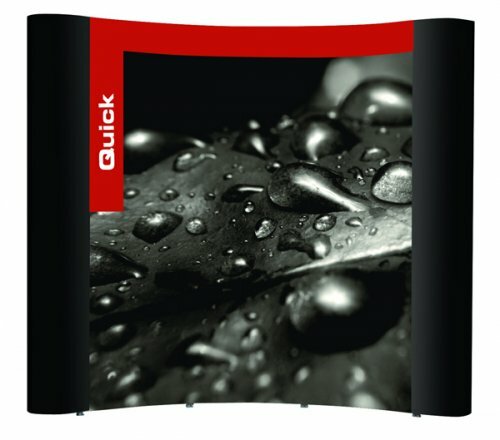 The most commonly seen pop up stand is curved with the graphics applied to the inner or concave side and ends, it is also possible to hang graphics from both sides and even join multiple systems together. Sometimes a curved frame is not the most practical, ie if you are exhibiting in a small shell scheme you may be better to have a straight system which has a much smaller footprint. Other formats include: L-Shaped, Tower & Wave, we even sell portable counters that utilise a mini pop up frame. Stylize Display Graphics are able to offer pop-up systems from all the leading manufacturers including: Eurostand, Ultima, Plex, Larsen etc. There is a wide choice of frame sizes and shapes to chose from. Pop up frame sizes are referred to by the amount of box sections or 'quads' that the framework is constructed from and not as some people believe by feet or metres, for example a 3x3 pop up actually refers to 3 quads high x 3 quads wide and a 3x4 frame is 3 quads high x 4 quads wide etc. 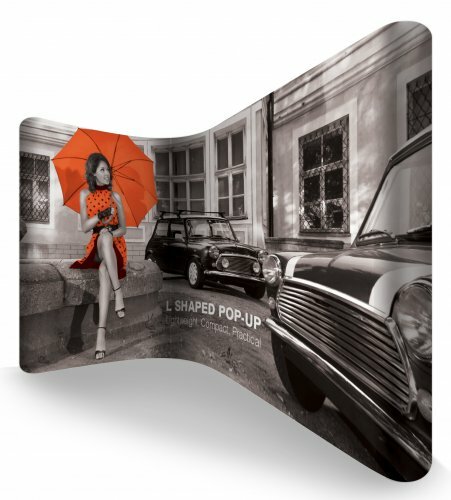 By far the most popular type is the 3x3 Curved pop up system, ideal for most situations such as trade show displays and larger reception areas, however we do offer larger and smaller variations should you require them. All the components that make up a pop-up ie the frame, magnetic bars, graphic panels, lights etc. are stored within a rigid wheeled carry drum, these are very often supplied with one of our bundle deals. All our stands are covered by the manufacturers warranty, our entry level budget pop up comes with a 1 year warranty whereas others have a no nonsense life-time guarantee. Why Choose Stylize Display Graphics? Because despite our exceptional friendly and personal customer service, super quick turnaround and high quality products, we still offer some fantastic 'value for money' bundles, these comprise everything that you could possibly ever need for a successful exhibition: pop-up frame, magnetic bars, high definition, fade resistant printed graphic panels which are protected with an anti-scuff and anti-scratch laminate, floodlights or spotlights, wheeled transit drum, graphic wrap for carry drum, a wooden counter top, 4-way extension lead and spare floodlight bulb etc. If you would like any help or assistance on which type of pop up display to buy please do not hesitate to call us on 01440 712713, one of our in-house graphic designers or sales team will be only too happy to answer any questions you may have. We can even design your stand from scratch to your exact requirements or update and amend your existing artwork. 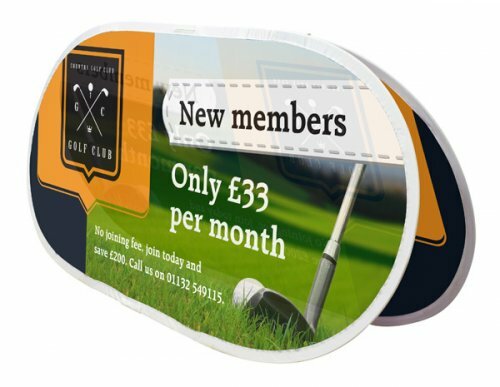 Please note that when your pop up graphics need replacing, even if you did not originally purchase the stand from ourselves we are able to produce replacement graphics for it, whatever the make or model. Thank you for the quick turnaround guys, just put up our pop up stand and it looks fantastic, very pleased!